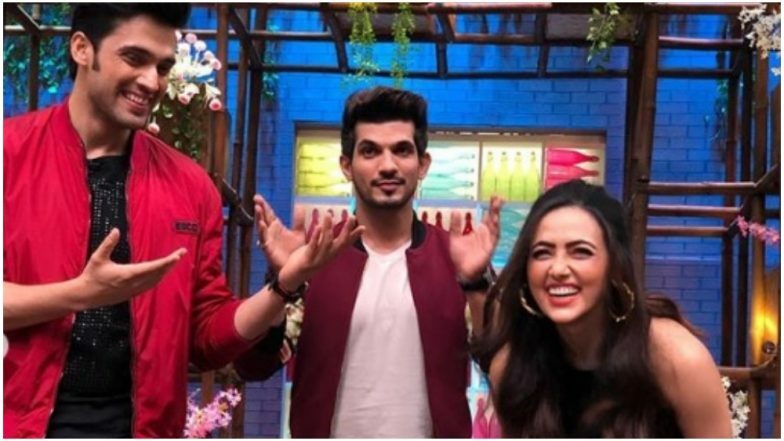 Parth and Sana, who had a blast while shooting for Arjun's Kitchen Champion, were even seen shaking a leg on a popular Bollywood number on the show. Sharing a couple of pictures on his Instagram handle, Arjun wrote, "So much fun on #kitchenchampion with @the_parthsamthaan @sanakhaan21 @barkhasengupta @aamnasharifofficial @nehalulla_nlj today. Don’t miss it guys Mon to fri @colorstv"
Parth looked dapper in a red jacket and carbon black denim, while Sana sported a stunning black jumpsuit and looked gorgeous. Also, watch Sana and Parth grooving to one of our recent favourite song from Varun Dhawan and Alia Bhatt's Kalank titled First Class. As the box cricket league season 2 just launched, Parth has been juggling between Kasautii and Box Cricket League. Parth Samthaan has been making headlines for quite sometime now. The actor was recently in the news for his link-up rumours with co-star Erica Fernandes. On the personal front, Parth bought his first house in Mumbai, which he has gifted it to his parents. Meanwhile, Sana is dating choreographer Melvin Louis and the two are rumoured to be participating in the upcoming season of Nach Baliye 9.